Crystal methamphetamine (also commonly referred to as “ice”) is a stimulant that accelerates the brain’s ability to communicate with the body. Crystal meth is far more addictive than the powder form of meth, most popularly known as speed. Crystal meth has a bitter taste and typically has a strong smell. It also has a small, chunky crystal-like appearance (which is where it derives the name “crystal” meth). Crystal meth can also take on a brownish appearance as well. The most popular way of using crystal meth is by smoking it. Because the drug is in smoke form, the user will feel the effects almost immediately. Injecting is another popular way to take the drug, and it typically takes around 15 to 20 minutes before the user will feel its effects. Crystal meth can also be snorted in which case the effects can take approximately 3 to 5 minutes before kicking in. 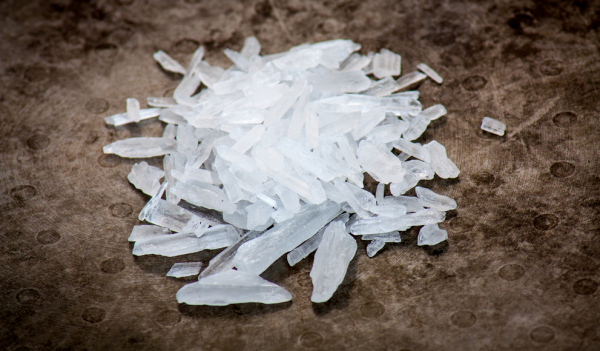 Crystal meth is a highly addictive drug that can be hazardous for a first time user. Once crystal meth has been taken its effects can last for as long as 12 hours. With that being said users often report insomnia up to a few days after taking the drug. When snorting crystal meth, the nasal passages can be damaged in the process and cause nosebleeds. Often users will turn to other types of drugs to help them cope during the “come down” stage. These drugs include cannabis, alcohol, and benzodiazepines. However, more often than not taking these drugs (amongst others) will cause the user to become dependent on both drug types. Those who use crystal meth on a regular basis will eventually develop a dependence on the drug. Eventually, they’ll need crystal meth to feel “normal” — whether that be socialising with friends, working, studying, or going about any number of normal activities throughout the day. Those addicted to crystal meth will eventually take less interest in the things that once held their attention. Their moods are often volatile, swinging one way or the next in the blink of an eye. These changes don’t exist just in the short term. Long-term complications often manifest themselves in the form of depression and anxiety. These effects may even be felt weeks or even months after the last dosage of crystal meth has been taken. As potent as it is addictive crystal meth has ruined the lives of hundreds of people. With withdrawal symptoms that range from exhaustion to hallucinations overcoming addiction can be an extremely challenging endeavour. That’s why it’s highly advised that you seek the help of a rehabilitation centre. Immerse yourself within an environment where you can escape the triggers of the outside world as you cleanse the drug from your body. Reach out today so we can match you with a rehab clinic to get your mind back on track.